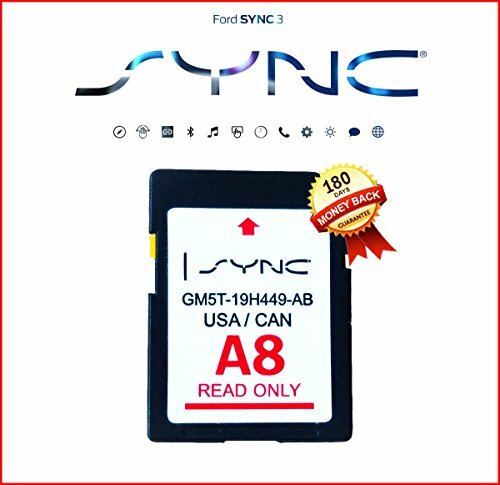 -FORD LINCOLN SYNC A8 Navigation System Map Update for the United States and Canada. GM5T-19H449-AB Never used. -Comes in Factory protective case (Not in Retail Packaging) Comes with Warranty. -This is the same Navigation SD Card included when vehicle is sold new. -This update will only work on 8-inch MyFord Touch or MyLincoln Touch SYNC systems that use an SD Card for Navigation. -This will not work in vehicles where navigation was not originally equipped or activated. This map includes new and expanded coverage in hundreds of cities, counties and metropolitan areas across the 50 United States, Puerto Rico and Canada. This update will only work on an activated 8-inch MyFord Touch or MyLincoln Touch SYNC system that use an SD Card for Navigation. If the top right corner of your SYNC system indicates "Navigation", it will work. If it indicates "Information", this item is not compatible. If you have any questions about this product by by Ford, contact us by completing and submitting the form below. If you are looking for a specif part number, please include it with your message.